PenDelfin Family Circle Club application form for membership in 1995. The PenDelfin membership gift for 1995 was the PenDelfin rabbit Bellman designed by Jean Walsmely Heap and the exclusive Model Of The Year for members only was the amusing PenDelfin rabbit Georgie & The Dragon designed by Doreen Noel Roberts. 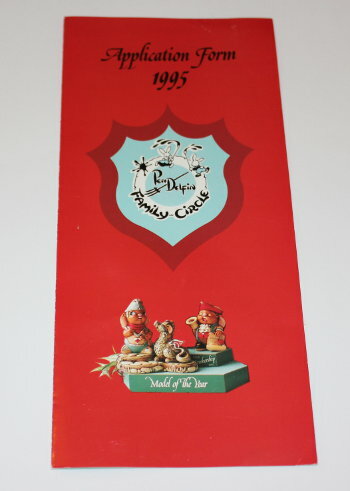 This PenDelfin leaflet is a foldout pamphlet which includes details of the PenDelfin collectors club and pictures of both your free PenDelfin rabbit that year which was the PenDelfin rabbit Bellman designed by Jean Walmsley Heap and a picture of the exclusive piece to members, the PenDelfin rabbit Georgie & The Dragon designed by Doreen Noel Roberts. Condition: Very good overall condition. A lovely piece of PenDelfin Club history.